I’ve now built two 3D printers from kits: first an Ormerod both designed and supplied in kit form by RepRapPro, and more recently a Mini Kossel designed by Johann Rocholl and supplied in kit form by Think3dPrint3d. So here is a comparison of the kits and my experience of assembling them. I won’t try to compare print speed or quality, because I don’t have enough experience of printing with the Mini Kossel yet. The Ormerod 1 kit that I assembled has now been superseded by the Ormerod 2, so I will try to make allowances for the improvements that I am aware of in the Ormerod 2. I shall use a point scoring system in which one of the printer kits is awarded a point where I consider it better than the other. At the end, we’ll see which printer scores the most points. But in reality, the things that I award points for are not of equal value, so the point totals will provide only a very crude comparison. The Ormerod 2 kit is priced in the UK at £449 + VAT and shipping. The Mini Kossel kit is priced at £387.50 + VAT and shipping, including the optional heated build plate. So the Mini Kossel wins a point because of its significantly lower price. You can save a few tens of pounds in either case if you have access to a 3D printer already and print your own plastic parts. The Ormerod has a build volume of 200 x 200 x 200mm. The Mini Kossel has a build volume of 170mm diameter in the XY plane and quotes 240mm build height. In reality, you can only use the full build height of the Mini Kossel at the centre of the build area, so a build height of 200mm is more realistic. So the Mini Kossel can’t print such large parts. One point to Ormerod. Several Ormerod users have converted their machines to extra tall versions for greater printing height. I think the same could be done quite easily with the Mini Kossel too. The quoted size for the Ormerod 2 is 500 x 560 x 410mm. However, the filament spool holder only accommodates a 350g spool of filament, such as the one supplied with the kit. In practice, everyone uses 1kg reels of filament. So you will also need room on the desk or the floor for a filament spool holder. My Ormerod 1 and the two spool holders I use take up an area 640mm wide x 400mm deep, excluding the power supply (which is part of the main build on the Ormerod 2, so I won’t count it). That’s a lot of desktop space! 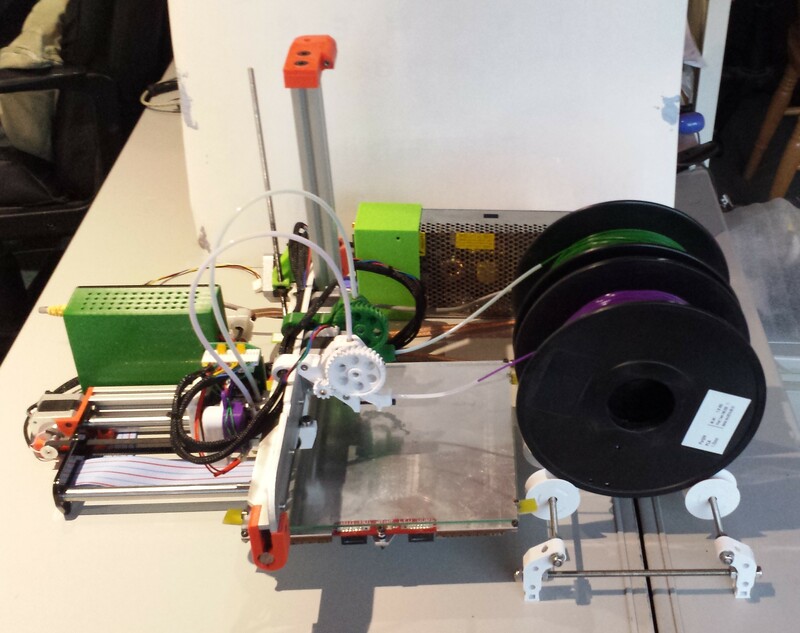 One Ormerod user has saved space by building a filament spool holder that sits under the printer. The footprint of the Mini Kossel is an equilateral triangle with 300mm sides. At the back there are connectors that protrude about 100mm. So the whole thing fits comfortably in an area 300m wide x 400mm deep, although it’s better than that because of the triangular front. The spool holder is attached to the top of the frame and takes a 1kg reel. As the frame is a rigid triangle, I think it should handle 1kg weight without significant deflection. The filament spool overhangs the desktop outside the main footprint, but as it is 600mm higher than the base this should not matter to most users. Overall the height is 700mm including the reel of filament, so much higher than the Ormerod. The power supply is a separate box 200mm x 100mm x 50mm, but it can be put on the floor because the cable to the Mini Kossel itself is long enough. I’ll award a point to the Mini Kossel for taking up less desktop space, and another for including a spool holder capable of taking a 1kg reel of filament. The Ormerod kit contains all the parts you need except for a few squares of white paper. The Mini Kossel kit contains all the parts you need except for a disk of corrugated cardboard used as a heated bed insulator. The instructions suggest cutting it out of the box that the kit is packed in, however that would have meant tolerating a large fold in the middle of the disk. So I had to rummage around for some suitable cardboard (it’s a shame the cardboard used to pack the heated bed itself was too thin). I can’t remember when I last owned a pair of compasses, and my children are grown up so there were no pencil cases for me to raid. So then I had to search for a kitchen utensil to draw round that was close to the required 165mm diameter. In contrast, the Ormerod kit came with a pre-cut cardboard insulator. So 1 point to the Ormerod. The Mini Kossel kit included some basic tools: two Allen keys (ball-ended at the long end), a 5.5mm spanner for M3 nuts, a knife for fettling the plastic parts, and a 3mm drill bit mounted in a handle for reaming holes in plastic parts. The Ormerod kit included no tools. I already had Allen keys, but when assembling the Ormerod I ended up buying a set of small spanners and two ball-ended hex drivers. So a point to the Mini Kossel for including the essential tools. The plastic parts supplied with the Ormerod kit are printed in PLA. The instructions say that if you want to print ABS then you need to replace some of the PLA parts by ABS parts, to withstand the higher temperatures. The Mini Kossel parts were printed in ABS already. So another point to the Mini Kossel. The Mini Kossel includes a bunch of cable ties for securing cables and drive belts. I had one left over at the end of the build. The Ormerod kit included a complete pack of 100 cable ties. So I had plenty left over after the build, which proved useful when I was making modifications to the Ormerod that involved un-tying and re-tying the looms. It’s a minor thing, so I won’t award any points this time. The stepper motors supplied with the Ormerod are 34mm deep Nema 17 (holding torque 21.5Ncm @ 1.33A), while the Mini Kossel motors are also Nema 17 but are 47mm deep (45Ncm @ 1.68A). The Mini Kossel design can afford to use heavier stepper motors because all the motors are non-moving, whereas in the Ormerod, the X and extruder motors are moving. I’m tempted to award a point to the Mini Kossel because the deeper stepper motors provide more torque, even allowing for the fact that they are run well below their rated current. However, the Ormerod stepper motors seem adequate for the task, so I’ll refrain from doing that. The Ormerod kit I received was missing the extruder drive components. I’ve heard of a few other people receiving Ormerod kits with missing parts. The Mini Kossel kit was complete, and all the parts had been checked off on each parts list. So a point to the Mini Kossel. It’s possible that RepRapPro have improved their dispatch department QC by now. The Ormerod kit came with a full 350g reel of white filament. The Mini Kossel came with 100g of orange filament loosely coiled, which tangles if you are not careful. So I award a point to the Ormerod. The USB cable supplied with the Mini Kossel was only 0.5m long – maybe enough to connect a laptop, but only if you position it carefully. The micro USB cable supplied with the Ormerod was a much more usable 1m, so it gets a point. Assembling the Ormerod wasn’t difficult, but took me many hours. Assembling the Mini Kossel was quicker. In part this may have been because of the experience I had gained with the Ormerod, however there are other factors. With a Cartesian printer such as the Ormerod, all three axes are different. 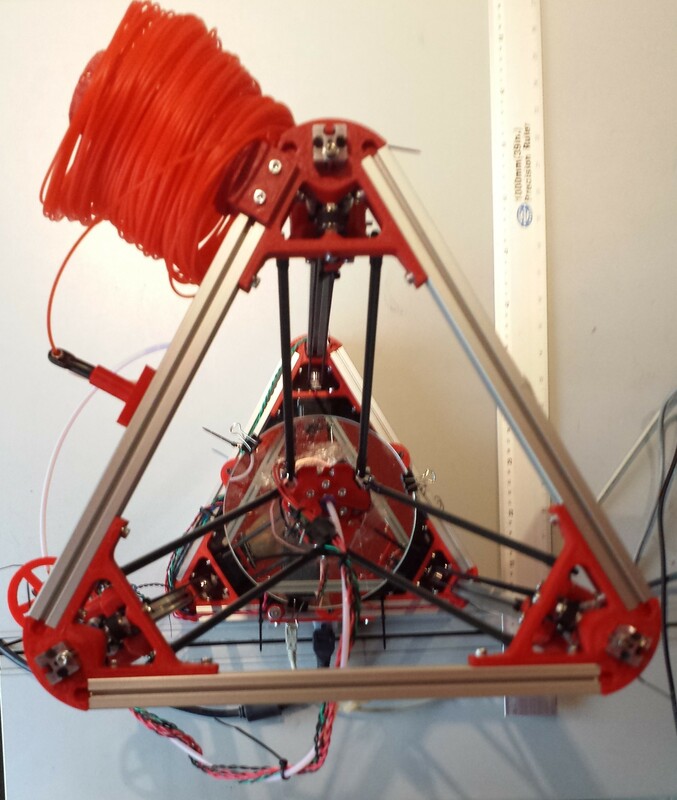 With a delta printer such as the Mini Kossel, most of the time you are building the same thing three times, which is faster as there is less to learn. One point to the Mini Kossel. The Mini Kossel came with a pre-built hot end, whereas for the Ormerod kit you have to assemble the hot end yourself. Another point to the Mini Kossel. When building the Mini Kossel I had to insert nuts in the aluminium extrusions at one step, then line up screws with them in a later step. This wasn’t difficult. However, the Ormerod uses T-nuts, so you can put them on the ends of the screws, insert them into the frames, and they rotate into place. This is easier, so a point to the Ormerod. Both the Ormerod and the Mini Kossel are designed so that the two ends of the belts lock into each other. On the Ormerod, the belt locks into a toothed groove in the plastic part that it attaches to, and another groove holds the two locked ends together. This works well, although it may require some fettling of the plastic to get the belt to fit. On the Mini Kossel, the belt goes around a peg and is then held locked into itself by a cable tie. The same is done at the other end of the belt. I find this less satisfactory than the Ormerod design, because it depends on the cable tie not slipping along the belt. So a point to the Ormerod. It should be possible to modify the design of the Mini Kossel carriage printed part to use the same scheme as the Ormerod. On both kits, there were plastic parts that were supposedly already the right size to accommodate nuts or hex bolt heads, but which in practice I had to fettle out. For both kits, I found that a very small number of the screws supplied were not of sufficient length. The Ormerod kit comes with Duet electronics. This is an all-in-one board using a SAM3X processor with 32-bit ARM core and native USB. From a programming perspective, it is largely compatible with the Arduino Due. Unlike the Due, it makes use of the built-in Ethernet support in the SAM3X to provide an Ethernet port. It drives a heated bed, the XYZ motors, one hot end and one extruder. An expansion board (the DueX4) is available to drive another 4 extruders and 4 hot ends, although modifications are needed to get stable and accurate temperature readings from the additional hot end thermistors. All motor currents can be set individually by the program. The Duet includes a socket for a SDHC card. The Mini Kossel kit comes with an Arduino Mega, a RAMPS 1.4 board, and a Panel One LCD control panel which includes the SD card holder. This is not such a neat solution as the all-in-one Duet, but it does have some nice features. It has two polyfuses on the board to protect the system against short circuits and overloads. The stepper drivers are on plug-in modules, which means that if a stepper driver fails, you can replace just that module instead of needing to replace the whole board or do some tricky SMT rework (unfortunately, stepper driver faults on the Duet do not seem to be especially rare). 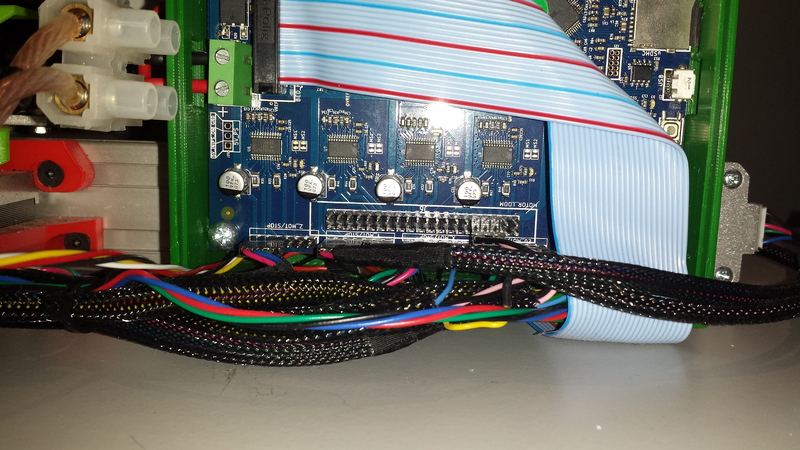 The RAMPS board can drive 2 hot ends, if you plug a 5th stepper driver module in for the second extruder. By having the SD card holder mounted on the Panel One, the main electronics and associated wiring can be hidden out of sight. I’ll award the Duet electronics of the Ormerod one point for supporting Ethernet (I find the web interface much better than Pronterface and the like), another for digital control of the stepper motor currents, a 3rd for using a 32-bit processor instead of the barely adequate 8-bit processor of the Arduino Mega, and a 4th for the direct USB interface with its potential for higher speed. The RAMPS/Arduino/Panel One combo gets a point for the polyfuses, a point for the plug-in stepper motor modules, a point for supporting a second extruder without the need for an expansion board, and a point for being able to print SD card files without an attached PC. Both kits are supplied with pre-made wiring looms, and no soldering or crimping is required. The wiring looms of the Ormerod connect neatly to the pins at the bottom of the Duet. 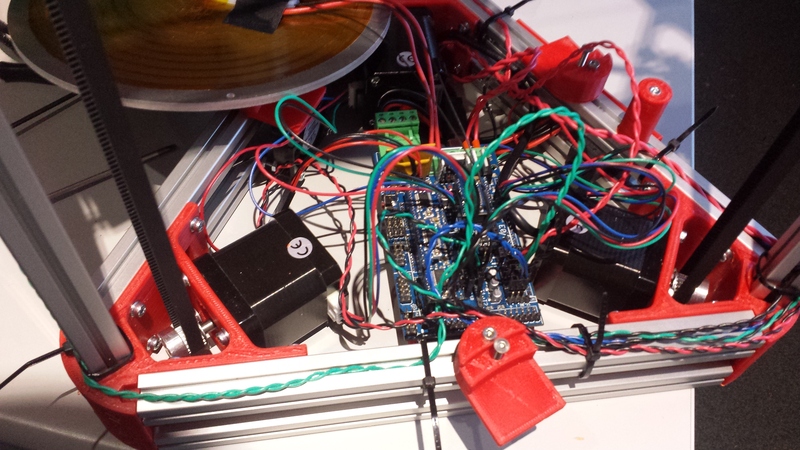 In contrast, the wiring to the electronics of the Mini Kossel is a rat’s nest, because wires arrive from all directions and have to be connected all over the RAMPS board. I could tidy it up with a few cable ties, however, it’s hidden under the bed, so I haven’t done that and I’m not awarding a point. On both the Ormerod and the Mini Kossel, belts need to be tensioned. The Ormerod uses screws that have to be moved along slots to get the right tension and then tightened. Getting the correct tension and keeping it when tightening the screws is not easy. With the Mini Kossel, you slacken the screws holding the top triangular frame in place, turn the 3 belt tension adjustment screws to get the right tensions, then tighten the frame screws. This is much more precise and merits a point. Getting the Ormerod print head level requires sliding a screw along a slot and tightening it. On my build, there was not enough movement in the slot. I had to fettle out the slot and replace the supplied 9mm x-runner bearing by a 10mm one. The slot range has been increased in the Ormerod 2, but forum posts suggest that some users still have this problem. The Mini Kossel print head is level by design, so it gets a point. Commissioning the Mini Kossel requires rebuilding the Marlin firmware several times, since many of the calibration constants are hard-coded in the firmware source code. In contrast, all the Ormerod parameters can be adjusted by editing the gcodes in the config.g file on the SD card. Fortunately, setting up the Marlin firmware build system is a lot easier than setting up to build the RepRapFirmware for the Duet (although as Marlin uses the awful Arduino IDE, making serious changes is more difficult). Still, the Ormerod wins a point. The RepRapPro firmware on the Duet includes a web interface. If you use my fork or zombiepantslol’s fork, you can also upload all necessary files to the SD card from the web interface or by FTP. Once you have homed the axes, the firmware prevents you from moving outside the limits, except for moving to negative Z; but the mechanical design of the Ormerod prevents damage in that case. The Marlin firmware has a lot of compile-time configuration capabilities, but less flexibility at run-time. It prevents you from moving to negative Z, but not outside the XY limits. With a delta printer, it is important to move the carriages down from the upper limits before moving the effector in the XY plane; but the Marlin software doesn’t enforce this. I’ll give the Duet firmware a point for being able to upload to SD card from the PC (so you never need to remove the SD card), and a point for limiting the axis movements. But I contributed towards the Duet firmware, so I’m biased! I already gave the Duet electronics a point for having an Ethernet port, so I won’t add another point for the web interface. Both printers are in theory capable of conversion to dual extruder operation. For the Ormerod, I published instructions on a dual-nozzle conversion in a previous entry in this blog, and a few other users have done similar conversions. For the Mini Kossel, there have been a few attempts such as http://sphereinabox.wordpress.com/2014/08/15/the-pain-of-a-dual-extruder-kossel-mini/. Dual nozzle support appears to be more difficult on the Mini Kossel because of the difficulty of aligning both nozzles to the same height (which is relatively easy on the Ormerod), and the problems caused by the extra weight of the second hot end on the effector. So I’ll award a point to the Ormerod for easier 2-nozzle conversion – but I am of course biased! The Mini Kossel electronics does have the advantage of supporting a second hot end and extruder with just an extra plug-in stepper driver, but I’ve already given it a point for that. 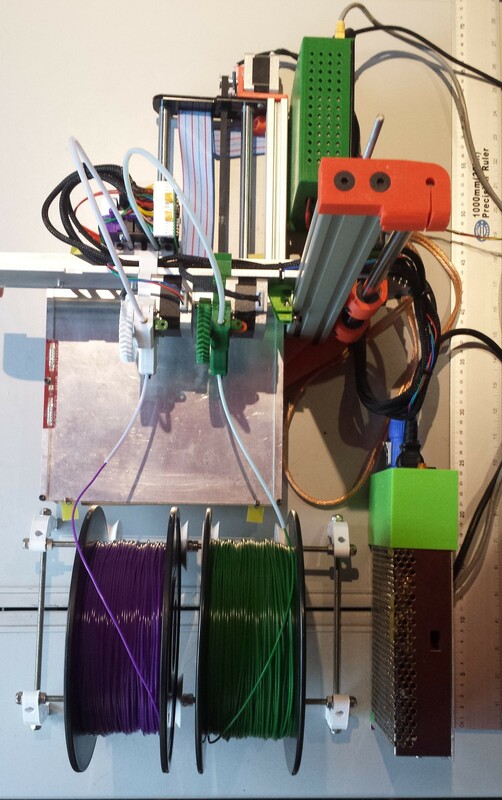 RepRapPro have been promising a multi-extruder add-on for the Ormerod for some time, possibly based on mixing three filaments in a single nozzle. But there is no word on its availability. This could also be a good solution for the Mini Kossel, because it would avoid the two issues associated with using multiple hot ends. The main maintenance item on the Ormerod is to oil the Z threaded rod fairly often, and to replace it from time to time (if you replace the Z nut by a brass one, then most of the time you can just replace the nut instead). The smooth rods need to be lightly oiled occasionally. The Mini Kossel appears to need no regular maintenance. However, I have read that the universal joints in the Traxxas ends on the carbon fibre rods are likely to wear out eventually and need replacing. Overall, I think the Mini Kossel wins a point on less need for regular maintenance. I prefer the looks of the delta printer, with its fixed bed and symmetrical appearance. It also looks really cool when printing! This is of course highly subjective, but I think it deserves a point. The print head on the Ormerod rotates about the X rod. Its weight pulls it down, and the X runner bearing stops it falling too far. I have already mentioned the problem of getting the head to be level in this arrangement. However, the advantage is that if the head snags on a piece of print that has curled up or that has a blob at one end of a run, then if the speed is not too high the head will simply ride up over the protrusion. I have observed this happening several times, and I am sure it has saved some prints. So a point to the Ormerod. To achieve the same on a delta printer, the print head could be spring-loaded. The Ormerod 2 uses screened cables and the electronics is in a metal enclosure. The reason is to achieve CE certification in respect of electromagnetic interference. The Mini Kossel does not, so it almost certainly produces more EMI. It may not matter to you, but I think the Ormerod deserves a point. The Bowden tube on the Mini Kossel is longer than on the Ormerod (500mm vs. 330mm). I think elasticity in the Bowden tube contributes to non-uniform extrusion (I intend to try adding pre-compensation for this in the Duet firmware). But as yet I have no evidence that a longer Bowden tube is worse, so I won’t award any points. The Mini Kossel extruder design features a screw to adjust the filament clamping force. The Ormerod extruder does not have this feature, and while this is OK for most filaments, I found it had insufficient grip on one filament that was slightly under-size. So a point to the Mini Kossel. You can upgrade the Ormerod extruder by printing the spring-loaded design from masonstonehenge at http://www.thingiverse.com/thing:318458. The Z probe on the Ormerod 2 uses a modulated reflective infrared sensor. It needs white targets (which can be underneath Kapton tape) to work. Although much better than the unmodulated sensor on the Ormerod 1, it is still slightly sensitive to ambient IR and can be saturated by bright sunlight. In contrast, the Mini Kossel uses a mechanical Z probe with two springs and a microswitch. It looks a bit Heath Robinson, but seems to work. Having said that, the automatic bed level compensation is not working for me yet, so I have more work to do on this. Some Mini Kossel owners use force sensitive resistors under the bed supports instead, but this does not appear to be compatible with using a heated bed. I produce an add-on hot end board for the Ormerod that uses two infrared beams with 3-way modulation for height sensing. It does not need white targets, and is very hard to saturate even in bright sunlight. I’ll try this on the Mini Kossel too. So how good are these kits? I now have two functioning 3D printers, so both are good kits. Adding up all the points I awarded, I get Ormerod 16, Mini Kossel 18. So on this very crude measure, the advantages and disadvantages of each kit almost balance out. The right printer for you depends on your personal needs and preferences. If you are constrained by budget and/or desk space and you don’t mind the smaller build area, then the Mini Kossel is probably the better choice. If you want the superior 32-bit electronics with web interface or an easy 2-nozzle conversion, or if low EMI is important to you, then the Ormerod wins. I think the suppliers of these kits could learn from each other. In particular, the Ormerod kit would benefit from including the essential tools, providing at least some of the printed parts in ABS instead of PLA, using push-fit pneumatic connectors for the Bowden tube, and better belt-tensioning devices. The Mini Kossel kit would benefit from including a pre-cut heat bed insulator in the kit (or at least a suitable piece of cardboard and a template), the belt-fixing approach used in the Ormerod, providing T nuts for attaching some of the parts to the frame, and the Duet electronics and firmware (which I am working on). Since writing this, I have converted my Mini Kossel to use Duet electronics. I describe the process here. Subsequently, I rebuilt the machine as a larger Kossel, which I describe here and here. The PanelDue touch screen control panel for Duet electronics is now available. I use one to control my Ormerod and another to control my Kossel. People often ask me how the print quality of the Ormerod and Mini Kossel compare. Both produce good prints, but I find that after the first layer, I can print almost twice as fast on the Mini Kossel as I can on the Ormerod before the print quality suffers. 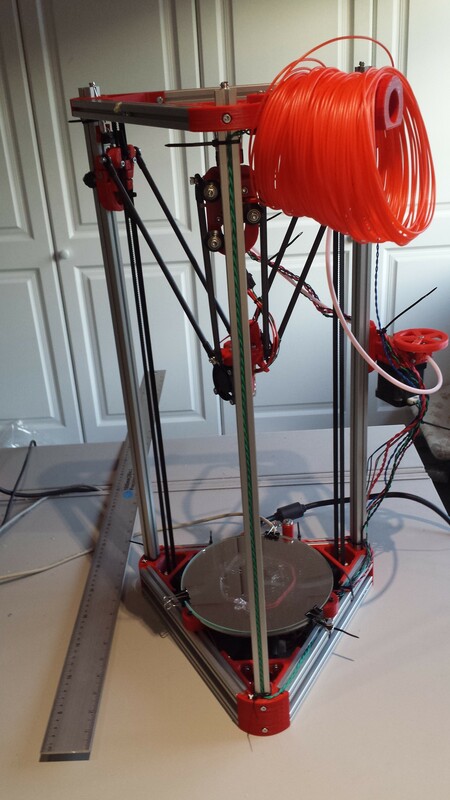 This entry was posted in 3D printing and tagged Mini Kossel, Ormerod. Bookmark the permalink. Great review David, but How do the prints compare for quality? I don’t have enough experience of printing with the Mini Kossel to compare print quality yet. It took me a while to find good slicing and temperature parameters for the Ormerod, so it may be some time before I get the best out of the Mini Kossel. Nice article Dave, I really like the look of the Mini Kossel, the small footprint is appealing. I love my highly modified Ormerod, but would love to have something indoors in my study (it’s freezing out in the workshop this time of year), and it looks like this would fit the bill. Keep us updated on how you are getting on with it. Great article David! I would like to by a mini-kossel, but you mention that `Dual nozzle support appears to be more difficult on the Mini Kossel`. Have you come across a solution for this problem in the meantime or do you think it is an insolvable problem? (I can´t find a lot of working solutions on the net). If you look at the more recent entries in my blog, you will find the entries on my large delta printer build. I have plans to upgrade this to dual extrusion, and will blog about it in due course.